AnyVid is free software to convert and download videos from several Internet websites. You can easily save your favorite videos from sites like Dailymotion, Facebook, Instagram or Vimeo. And you can convert videos to “usable” formats such as WMV, MPEG or MP3. It is possible to convert videos to WMV, MPEG4, MP3 (audio only) or simply download the videos in their original format. However, downloading from some sites does not allow you to select another format from the drop-down menu; it may be a problem with site videos. AnyVid Video Downloader can download from the following sites: Dailymotion, Youtube, Vimeo and others. AnyVid is not limited to the sites listed, because many more sites are supported “unofficially” through the automatic recognition site of AnyVid. Some of the other popular sites include Facebook, Instagram, Vevo, TED, Archive and others. By the way, AnyVid can also download HD videos from sites that have support for high definition. Just as we know, AnyVid is easy to download on MacOS and Windows. It has multiple features and the installation process of Any Vid is simple. On using AnyVid with maximum power, many resources are not consumed. Certainly, AnyVid is a great choice as it is a handy video converter to run in association with heavy-duty apps. Practically, installing this tool can be completed in few minutes. Compatibility: This software stands out from its counterparts in that it supports many popular video formats, for example MPEG2 TS, HD H264 TS, HD DivX, HD H.264, HD Quick Time, HD MPEG4, HD FLV and HD MKV. Customization: If the user wants to improve the audio and video quality of the rendering, he must input the format that they want to convert. The quick downloading speed is one of the main USPs of this software. Batch Processing: The high performance of HD Video Converter is perceived when it converts many files simultaneously. Its process speed does not slow down and it does not create any temporary files as it runs to save disk space. 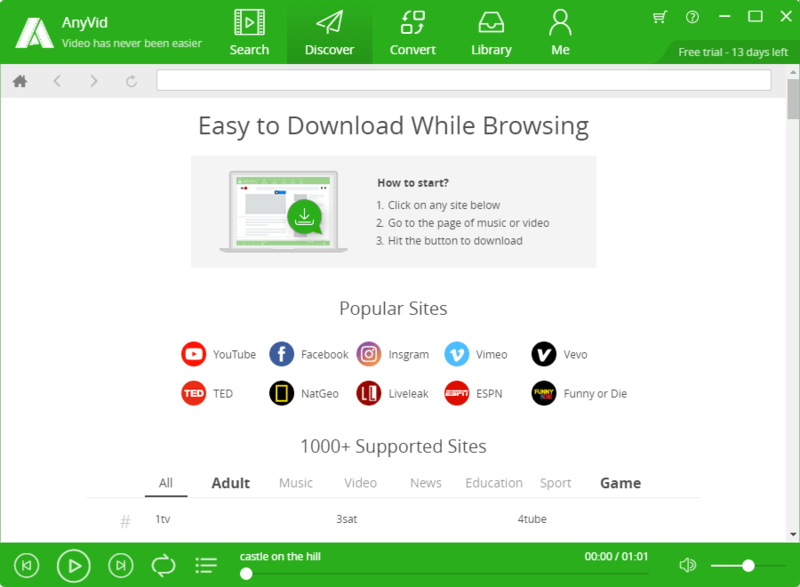 Download while browsing: While the regular Video downloaders don’t allow you to view and browse through the files while it is downloading, AnyVid Video downloader lets you accomplish both the tasks in one go. Make the best out of your time as you download and look for new videos to download simultaneously via batch download. Easy to search videos by song name, artist name and video URL: AnyVid by Amoyshare lets you search and browse through the videos by the artist name, song name, video URL etc. It lets you access the videos of your choice without many hassles. You can play before downloading: You can also play the video before they are downloaded to let you preview whether the right link or video is being copied and downloaded. Support multiple video and audio formats: Unlike other video converter and downloading software, AnyVid enables you to download multiple video and audio formats from more than 1000+ sites, popular or not so popular. No ads, no plugs-in: For the users who are frustrated with the regular ads and plug-ins displayed on their screen, AnyVid offers a relief. Besides YouTube, also support more than 1000 sources, such as YouTube, Facebook, TED and so on. Batch downloads YouTube playlist: Want to download more than one video at a time? Thanks to the batch download feature, you get quick and effortless multiple download option without hanging issues on your device. Convert local media file to the format you need: The conversion from low quality videos to higher, from a local media format to the one supported by your device, all the features are already built in this software.